COLOGNE, Germany – End of July Europe’s biggest dealer cooperative will present its 2015 program to its members at the Cologne Messe. One month later ZEG will launch its Bulls range at Eurobike. Yesterday, the online news service for the bike sector in Germany – Velobiz.de – reported on the ZEG show schedule for 2014. After Ispo-Bike was stopped, which for years was the platform where ZEG hosted its dealers for the presentation of its next year collections, the question was where the dealer cooperative would turn to. ZEG’s Marketing Director Franz Tepe revealed the company’s plans to Velobiz. From 25 to 28 July ZEG will organize its own event at the Köln Messe (Cologne Fair). Here the company as well as its contract suppliers will present their 2015 bike models and P&A ranges. Next to the event in Cologne ZEG will also be present for the very first time at Eurobike. Here the dealer cooperative that unites about 1,000 retailers from Germany, the Benelux countries, France, Austria and Italy, will focus its presentation on sports bikes and products. In particular the company’s Bulls brand will be highlighted at ZEG’s Eurobike booth. 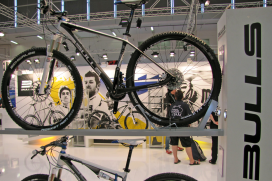 The biggest bike show in the world – Eurobike – will take place from August 27 – 30. The Eurobike Demo Day is scheduled for August 26, 2014.